Pushover 3.4 has been released today for iPhone and iPad, Android, and Desktop, and brings full support for animated GIFs and monospace text support. Many Pushover users rely on our e-mail gateway to receive Pushover notifications from e-mails sent out by devices that don't directly support Pushover, such as security cameras. After adding image support, we received a number of requests from users to support animated GIFs that are sent out from these security cameras, showing a few seconds of activity instead of just a static snapshot. Animated GIFs can be sent directly to our API as well, as detailed in our API documentation. In addition to animated GIFs, version 3.4 brings support for monospace text in messages (but not notifications at this time, due to limitations on mobile platforms). This text is shown in a monospace font that preserves spaces and tabs, which can be useful for sending a formatted message with columns. These messages can be sent to our API with the monospace parameter set to 1. Pushover 3.4 is available now for iPhone and iPad, Android, and Desktops/Browsers. Pushover has been available as a GitHub Service since 2002, making it easy to get Pushover notifications each time commits were pushed to your repositories. GitHub has recently announced that they are replacing GitHub Services with webhooks, which means the Pushover support in GitHub will be going away in January 2019. Any repositories that you are receiving Pushover notifications from will need to be updated to use Pushover’s new GitHub webhook. Replace “YOUR_USER_KEY” with your actual Pushover user key, which you can find on your Pushover Dashboard. The rest of the fields can be left at their defaults, which will send Pushover notifications for “push” actions just as the old GitHub Service did. Note: Our webhook currently supports the “push” event. If you need custom notifications for other types of events, please contact us. To activate it, just click the moon icon in the upper left corner. Your dark mode setting is saved so it’ll default to that each time you open the Desktop app in the future. Today we’re happy to announce the release of version 3.2 of our Pushover apps for Android and iOS which feature two-factor authentication and an optional dark theme. Our website and apps now support Two-Factor Authentication (commonly referred to as 2FA or Multi-factor Authentication/MFA) for increased account security. We currently support TOTP-based 2FA through mobile applications such as Google Authenticator and Authenticator for iOS. Once your account is configured for 2FA, you’ll be required to enter a 6-digit code from one of these apps which changes every 30 seconds, in addition to your account password. Logging into our mobile applications with Two-Factor Authentication requires the new version 3.2 of our apps. You can activate 2FA on the settings page of our website. A common feature request we’ve received is for a dark theme in our mobile apps. Pushover users often have to use the app late at night when working on call, or just prefer using darker-themed apps. You can download version 3.2 of our apps today in Apple App Store and Google Play. Version 3.0 of our Android, iPhone/iPad, and Desktop apps are available today which include support for receiving push notifications with image attachments! A popular use case of our E-mail Gateway has been to receive instant notifications from internet-connected security cameras when they detect motion. Many of these cameras attach a snapshot image of the motion to the e-mail which, up until now, has been discarded and passed through as just a text notification. Starting today, these e-mails will also pass through the attached image which will be displayed in the Pushover notification and in the app. Currently, image attachments are limited to 2.5 megabytes. Once an image attachment has been fully downloaded by your devices, it is stored offline on your device and then deleted from our servers for increased privacy. For software accessing our API directly, we have new documentation with all of the details for how to upload image attachments. We hope you enjoy this new functionality and find great new uses for sending images with Pushover. Download Pushover for iOS and iPad, Pushover for Android, or get started with Pushover for Desktop. Pushover is used in many organizations for sending network monitoring alerts to Ops teams and even in many volunteer firefighter departments to send out secondary alerts. A popular feature Pushover has had for years is our Emergency-priority alerts, which repeat at a given interval until the recipient acknowledges it by tapping a button on the notification. Combined with per-alert sounds, this can be enough to get a user’s attention when they’re busy (or wake that unfortunate on-call person from their slumber). A key feature of our new Pushover for Teams service is the ability for team members to configure SMS fallback, which will retry emergency-priority alerts over SMS in cases where the user is out of range of reliable Internet service, or to do custom alerting not possible with our mobile apps due to OS restrictions. Here we’ll walk through setting up SMS fallback and configuring an iPhone running iOS 11 to bypass the hardware mute switch and Do Not Disturb mode, both of which may be turned on when a user is sleeping and interfere with receiving emergency alerts. To get started, login to your Pushover Dashboard and click on Configure SMS. If you do not see this option, you’ll need to signup for Pushover for Teams first. Next, select your country and enter your phone number. Note: SMS fallback is currently only supported for US, Canada, and UK mobile numbers. You should receive a confirmation code on your mobile phone within a few seconds. Your SMS number is now setup and configured with some default settings. Change them if you want and click Save Changes, otherwise you’re all done. For iPhone users, you can configure Pushover’s SMS messages to bypass the hardware mute switch, as well as Do Not Disturb mode (emergency-priority messages already bypass your configured Pushover Quiet Hours). Note: Pushover messages delivered outside the US and Canada are sent from a different, country-specific number, and will differ from the 312-757-PUSH number shown here. Open the Messages app and tap on the notification from Pushover that included your confirmation code. Then tap on the icon at the top. Next, tap on Create New Contact. Assign a name in the Company field if you want, and then tap on Text Tone (not Ringtone). Enable the Emergency Bypass option, and optionally chose a distinct vibration pattern and alert tone. By default, iOS will only play the text message sound and vibration once. To enable automatically repeating the alert until you dismiss it, open the main Settings app, then Notifications, then Messages. Tap on the Repeat Alerts option and choose the amount of repeats. Now when receiving an emergency-priority notification through Pushover that is not acknowledged before it’s set to retry (and according to your SMS retry setting entered on the dashboard), you’ll get the next retry as a text message which will now bypass your device’s mute switch and Do Not Disturb. To acknowledge the SMS message, just text back 1. If you’re new to Pushover, try it out for free on iPhone/iPad, Android, or Desktop. For more advanced features like SMS fallback demonstrated here, check out Pushover for Teams. We’re very excited to announce Pushover for Teams: a monthly service option ideal for companies and organizations deploying Pushover to multiple users. For more information on Pushover for Teams or to signup, check out our Teams page. 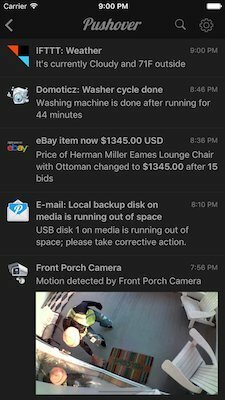 Our new Pushover for iOS update is out today and includes many great features such as per-application icons in notifications, synching dismissals of notifications across all of your iOS 10 and Android devices, and a new Apple Watch app. One new feature we’re announcing today is our new Glances API which lets you push data directly to a complication on your Apple Watch. This is separate from our Messaging API which is great for urgent push notifications that pop up on your iPhone and Apple Watch. For those occasions when you want to send small amounts of data that you can glance at periodically throughout the day, such as the number of items sold at your store today, or an update from your alarm system notifying you the garage door is still open, our Glances API makes this possible. To get started pushing data to your Apple Watch, just add the Pushover complication on your watch face, then consult our Glances API Documentation to send data to it. While our Glances API currently only supports the Apple Watch, we plan on bringing this to other screens in the future such as other smart watches and widgets on Android and iOS. We are also working on adding this new API to our existing integrations such as IFTTT, to make it easier for everyone to use. Pushover is excited to be a part of Zapier’s launch of their new Zapier Push feature which allows users to manually trigger Zap workflows from their new Chrome Extension. Users of Zapier and Pushover can easily send out Pushover notifications from the click of a button right from Chrome. With Push by Zapier, you can quickly push out pre-saved Pushover templates or type in a new message each time. You can find out more about Push by Zapier on their blog. Pushover’s E-mail Gateway is a popular feature used by many of our users to get Pushover notifications from websites and legacy systems that can’t integrate with our API. Every Pushover user has been able to receive e-mail at Your-Pushover-User-Key@api.pushover.net and instantly receive it as a push notification, and this week we’ve launched a new E-mail Gateway with some great new features. A common request we’ve received from our users is to have shorter e-mail addresses. Some websites and legacy systems would not accept a 47-character address such as uxu6r9d3hk3s7bbj4vwjzbgqtahrnk@api.pushover.net, and so our new e-mail gateway offers much shorter e-mail addresses at a new domain pomail.net, such as jc5apkksxz@pomail.net. Every existing Pushover account has a new shorter address already assigned to it (in addition to still supporting your old 47-character address), which you can find on your dashboard. After launching our initial E-mail Gateway years ago, we heard from users asking for the ability to customize notifications, such as which devices would receive the message, setting the high-priority flag, and setting a custom sound. We supported these settings by adding them to the e-mail address, creating addresses like uxu6r9d3hk3s7bbj4vwjzbgqtahrnk+device=iphone+p=1+s=pianobar@api.pushover.net. As you can see, these addresses got pretty long, and some outdated e-mail systems would not accept e-mail with an address containing the characters + and =. Our new E-mail Gateway allows you to change these settings from your dashboard without having to change the e-mail address later. Some users were hesitant to use their old Pushover e-mail address on an untrusted website since it contained their Pushover user key, worried they might receive spam notifications if their e-mail address were to be given out by those sites. With our new shorter addresses that don’t contain your Pushover user key, you can create new aliases for each website or service, each with its own settings, and then delete them later without worrying about spam. Once an e-mail alias is deleted, any new e-mail to it will be rejected and bounced back to the sender. Pushover’s new E-mail Gateway is available now. You can find your new shorter e-mail address on your dashboard as well as customize options and create additional aliases. Note: While our new E-mail Gateway offers new addresses and settings, we will always support the older @api.pushover.net addresses (with custom settings) that you may already be using. If you have any questions or comments about our new E-mail Gateway, please contact us.